Much of the Iraqi city of Mosul remains in ruins after a four-year battle to retake it from so-called Islamic State ended last summer. For residents there Saturday’s parliamentary election will focus on what politicians can do to help in its reconstruction, as much of the city is still without even basic services. Mohammed Abdul Haq is a Mosul resident. "We need water and electricity," he says. "We have been visited by officials and they know what we need. They see that all these houses have been destroyed. And my father died just like many other people, because of the war and because of Daesh. "We don't have ration cards. We want the officials to help us. We need water and electricity. And we received rations for a month only and for the next three months there is nothing." 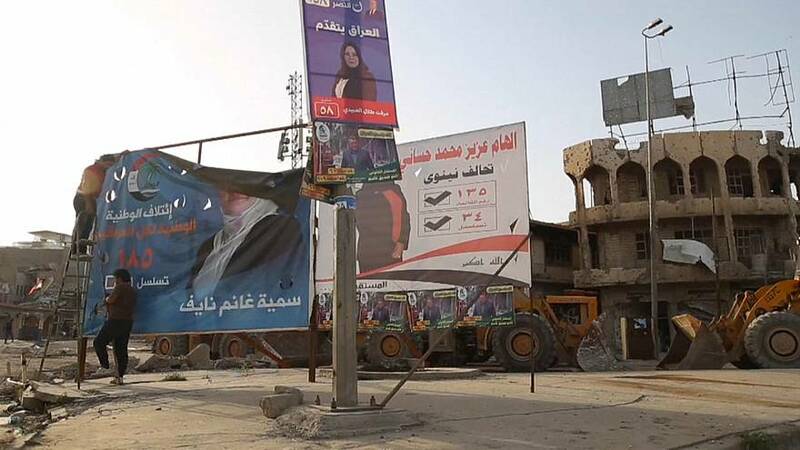 Political promises can be seen on posters and billboards throughout Iraq's largest Sunni city. Sumaiya Ghanem is a candidate. She is a university lecturer and former humanitarian aid worker and wants compensation for people who lost their homes in last year's fighting. "Today we are seeing that votes are being bought and sold for money," she explains. "They have lots of money and they are able to spend millions of dollars in this election. And all this money that has been spent here, it has been stolen from your kids who are here today. And they will steal more and more." But she, along with other women candidates, has faced some resistance from more conservative elements. The run-up to the elections has been marred by violence with one candidate being shot dead late on Sunday near to his home. Voter registration is still low partly because many displaced people have been unable to return due the destruction. But for ordinary citizens the importance of political stability is about laying stable foundations for the next generation.